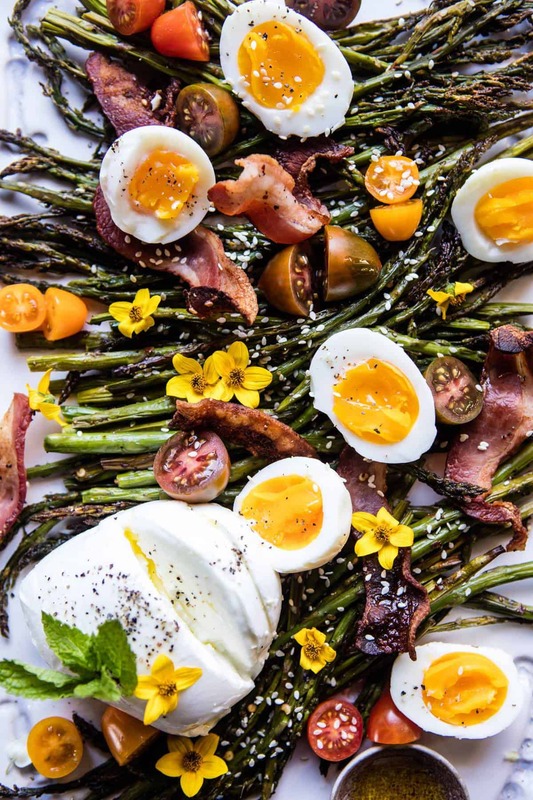 If there’s one recipe that screams Easter, this Sesame Roasted Asparagus, Egg and Bacon Salad is it. Well, I guess there are a few recipes that scream Easter, like this carrot cake, and maybe this roasted rack of lamb. But I dunno I feel like anything with asparagus and eggs is so very EASTER. Maybe I should have said…if there’s one salad that screams Easter, this is it. I don’t post side dishes very often (although oddly, I did post these crispy oregano smashed potatoes as another Easter side just last week). I tend to sway towards making full on dinners. Not just like one part of a dinner, but like the whole shebang. I guess I just like the thought of presenting you with a FULL plate. But today, I’m sharing a delicious side, that’s not only a great dish for dinner, but for brunch as well…so kind of a double duty side! Totally cheesy, but I mean, it is true! Ok, so here’s the deal with this basic salad. I’m one of those people who loves asparagus simply roasted with olive oil, salt, and pepper. It’s just so good when it’s super simple like that. 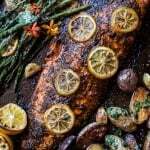 With this dish, I really wanted the asparagus flavor to shine, but I didn’t want to present you guys with just roasted asparagus. So I came up with this salad. It’s kind of like an asparagus BLT, but with soft-boiled eggs and a whole lotta of buffalo mozzarella. And ok, some edible flowers too because I am totally head over heals obsessed with them. Like it’s seriously becoming a problem. Maybe we can call this dish a BAT (bacon, asparagus and tomato)? Ahh, no that really doesn’t work, but you get the idea. The asparagus is replacing the lettuce, which I personally think is pretty great. The real secret here though, is the way that everything gets cooked. When I was testing this recipe, the thought of frying bacon on the stove sounded really just…not fun. Cooking bacon on the stove is the greasiest, grease fest ever, and I really just don’t like it. As I was laying the asparagus out on the baking sheet, it suddenly came to me…cook the bacon over the asparagus. I know, like duh, how obvious! But you guys, laying the bacon over the asparagus allows the bacon fat to drip down and flavor the asparagus. It’s actually kind of genius, and there’s NO mess to clean up afterwards….well you have your pan to clean, but that’s a heck of a lot better than a whole stove if you ask me! 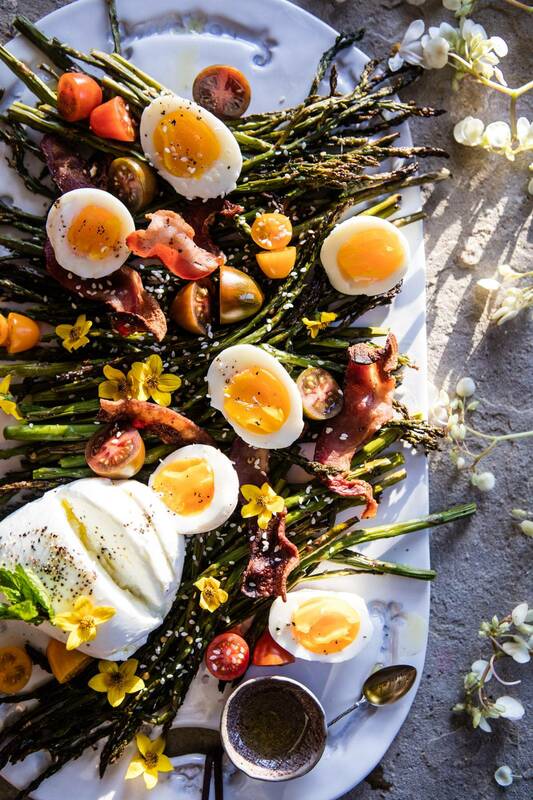 I topped the asparagus and bacon with fresh cherry tomatoes for a burst of fresh color and flavor, and then of course, some soft-boiled eggs. You could also use all those hard-boiled eggs you guys might be dying this weekend with your kids. I know that Asher is dying to dye some eggs. I told her that should be something she does with Mom, but then she said that I’d be more creative. No offense Mom, but she might be kind of right (we’ll invite you down). After Asher said that I did a little googling and came across a whole bunch of dye free ways to dye eggs. I am SO into it, now I actually want to dye the eggs…can I please be eight years old again?! PS. are you dying eggs this weekend? That was the best Easter activity when I was a kid. Dying eggs and the giant Easter egg hunt my mom would set up for my brothers and I. Again, can I please be eight years old…not really, but maybe for like five minutes! Anyway, to finish up this salad I really wanted something cheesy. I had my heart set on one of the balls of buffalo mozzarella that’s tied into a knot at the top, but my local Whole Foods was out, so regular buffalo mozz it was. Then I drizzled it with a balsamic vinaigrette and done. Pretty quick and simple, but perfect for spring. This would also make a great summer side to just about any meal. Plus, it’s kind of gorgeous with the pops of color from the tomatoes and eggs. And come one, lets not forget the crispy, salty bacon. Perfection when paired with asparagus, eggs…and cheese! This isn't just any ordinary salad! 2. On a large baking sheet, toss together the asparagus, a drizzle of olive oil, salt and pepper. Add the sesame seeds and toss once more, arrange the asparagus in an even layer on the baking sheet. Lay the bacon flat over the asparagus. Transfer to the oven and roast for 20-25 minutes or until the bacon is crispy. Remove from the oven and drain off most of the bacon grease. Add the basil and gently toss. 3. Meanwhile, whisk the olive oil, balsamic, lemon juice, and a pinch each of salt & pepper, and crushed red pepper flakes in a small bowl. 4. 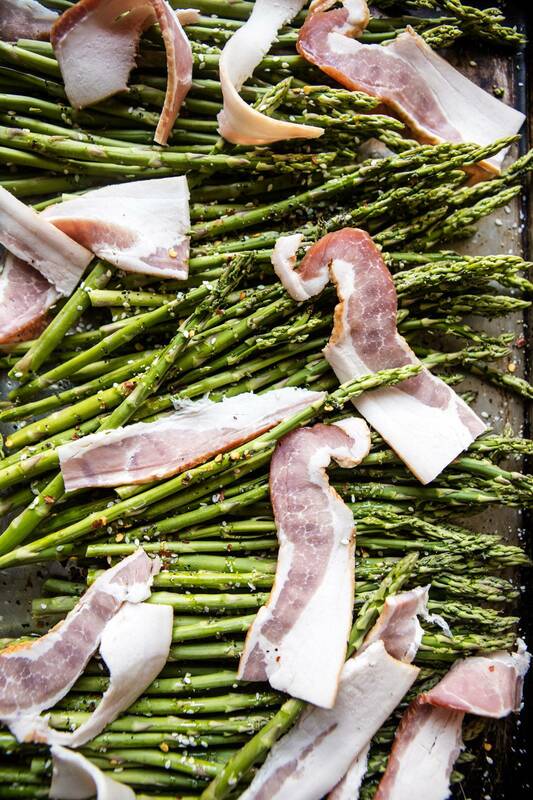 Arrange the asparagus and bacon on a platter. Tear the cheese and scatter over the asparagus. Add the tomatoes, and eggs. Serve drizzled with the balsamic vinaigrette. Enjoy! Spring on a pretty platter…and delicious too! Yes! 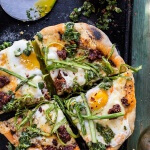 Springtime Pizza with Chipotle Romesco, Eggs + Shaved Asparagus Salad. 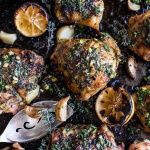 Garlic Butter Roasted Chicken Thighs with Charred Lemon Salsa Verde + Asparagus. I would eat this side dish as a salad at lunch time. BAT salad! 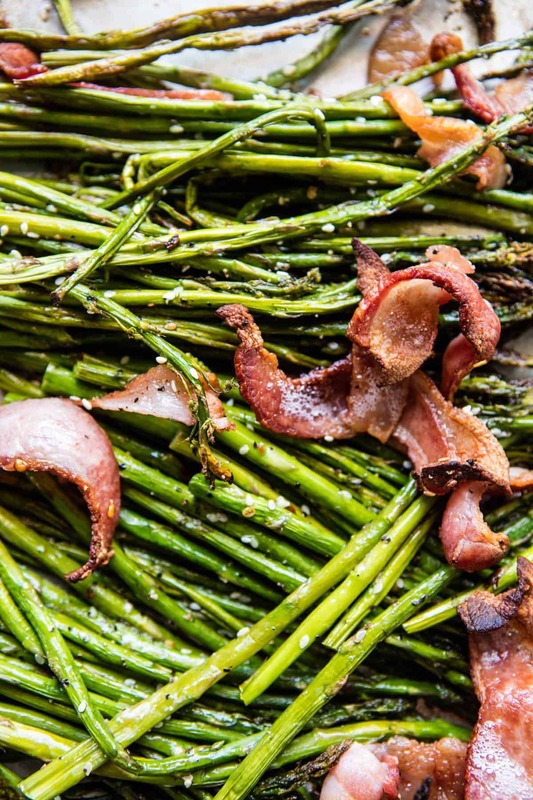 Baking the bacon on top of the asparagus is an absolutely genius idea and now I want to bake bacon over everything. This could be a problem. Haha! Its so good! I can’t stop doing it either! 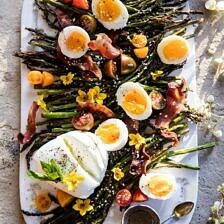 I love asparagus and bacon As for eggs, I love them prepared every way. I am sitting here sipping on a first coffee of the day thinking that I am hungry. Thanks for that appealing recipe and visual. Hope you got to make a delicious breakfast! Thanks Judes! So perfect for Easter! I’m loving all these amazing flavors you’ve got going in this dish. Awh thanks Tori! Hope you have an amazing Easter! Thinking about having it for brunch ! Thank you ! Hope you loved it, thank you! So beautiful! 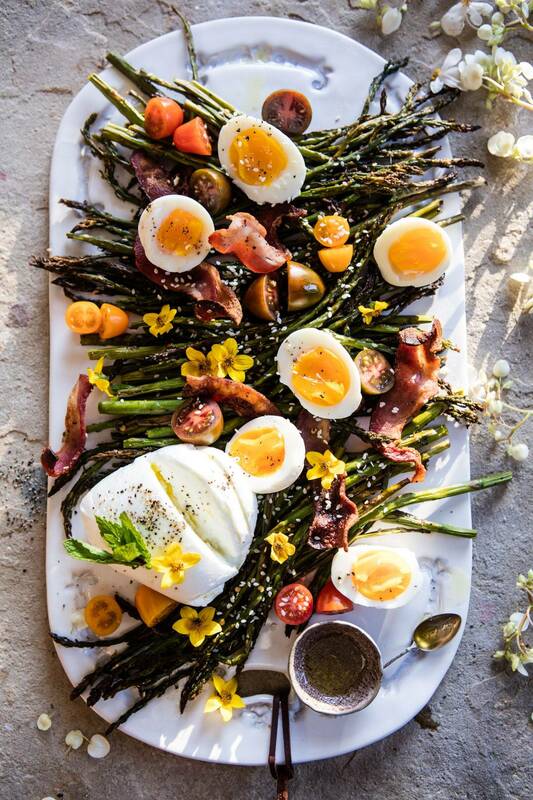 And what a great idea to cook the bacon with the asparagus…we’ll be eating this soon! Just one question…where do you get the edible flowers you use? Are they from your garden or do you buy them? Hi Yolanda! I buy them online. Link below! Thanks! This is my kind of salad Tieghan! Awesome list of ingredients and perfect for Easter! Yay, so happy your into it Mary Ann! Hope you have an amazing Easter! Sesame roasted asparagus is THE BEST!!!! And eggs on top? Pretty sure asparagus and eggs were made for each other. This looks so delish! Right! I never would have guessed it but they work so well together! I have been too!! So perfect! So happy you like it Sara! Now I know that I was reading a blog with a post that is very commete. Thank you for sharing the information you post. I just subscribe to your blog. This is a great blog. Had this for dinner last night… Outstanding! Thank you. So happy you liked it, thank you! 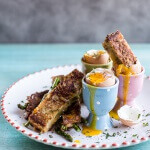 yum-fest…it was our launch into Easter! Made up crazy other side that I know you could just go wild with…lightly steamed sugar snaps, red onion, tangelo slices, sliced yicama, fresh chives chopped and a ‘vinagarette’ using lime juice and zest vs a vinegar…after the fact I remembered we had an avocado…that would be awesome included! Thank you…just got some fantastic asparagus and .I was craving bacon-your recipe was MINE! Win and Double Win! Happy Easter everyone! Ah the cheese might be my favorite part, but thats okay. Still sounds like it was delish! What a bright, delicious, beautiful bowl Tieghan! Perfect for a Monday. And perfect after a weekend of indulging! Awh yay, so happy you like the bowl! Thank you! Please let me know if you’re looking for a author foor your site. You have some really good posts and I thijk I would be a good asset. “Head over heals,” =”head over heels.” But that particular typo was funny! Totally making this, sounds delish, thank you! Haha oops I’ll have to fix that! I am really glad you like the salad though Stephanie! Thank you! Wonderful dish with or without the light dressing. Late to the party, but Yum! Have added sesame seeds, cherry tomatoes and buffalo mozzarella to my shopping list. I need to practice, right? I hope you love this Nan! Thank you! I have been browsing online morre than 3 hours today, yet I never found any interesting articoe like yours.